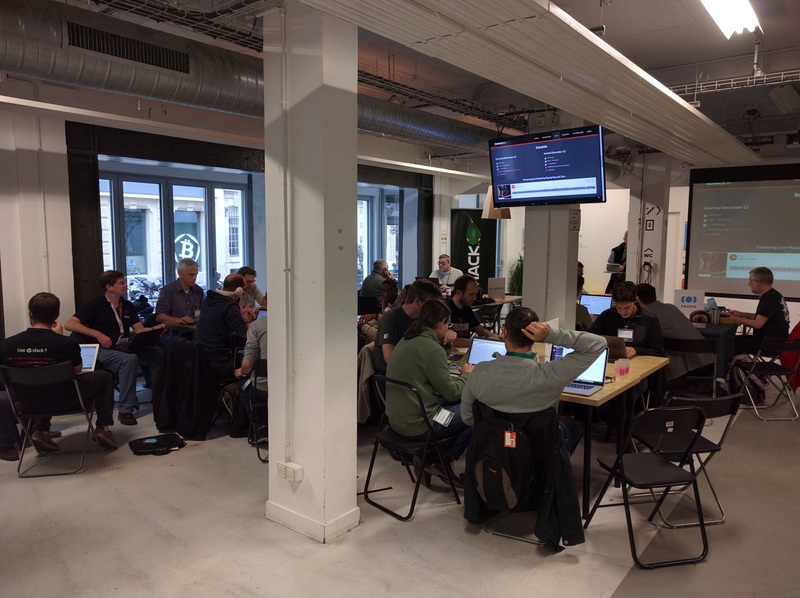 TADHack Paris ran over the weekend of the 12th and 13th December at NUMA Sentier, just before the WebRTC Conference and Expo. The Hackathon focused on WebRTC and the sponsors’ resources: Apidaze, Circuit by Unify, Telestax, Tropo (CiscoSpark), Truphone, and VoxImplant. The sponsors provide an introduction to themselves and their resources in this TADHack Paris webinar. We had about 60 people on-site, with several remote entries. By 10 minutes past the official start time about 40 people had arrived, by lunchtime we brought in extra chairs. This is part 1 of the TADHack Paris Review, because of the number of hacks the review will run over several weblogs. Diversity is important for creativity and to TADHack, we had good diversity in developer backgrounds from those with little experience in hacking or telecoms, through those more enterprise/web focused that were building experience in telecom APIs and platforms, to renowned hackers. Musical entertainment on Saturday evening was provided by the Randy Resnick Trio featuring Ellie Panton; yep, the Panton clan was at TADHack. Below is a clip of “The Woman in White” composed by Randy Resnick from the CD “To Love” available on iTunes and Spotify. We ended up with 14 pitches, taking about 2.5 hours to present. The audience was ready for a drink after that marathon session We kicked off the pitches with a remote pitch from Vince Puglia, “just-text.us,” a SMS based CRM app. Below is the pitch video, audience Q&A, and his slides. Vince used Telestax RESTComm to build a simple SMS application, a BOT, which handled most of the customer queries. And when a customer question was out of scope that it could handle, the question was forwarded to a person, likely the small business owner. We’re increasingly seeing SMS becoming a default UI, as people are fatigued by too many apps, especially from businesses or services that are used infrequently. Even my local garden center has an app, I just want to know when they are open, not download yet another app to find that out. No opening times on their door, just an advert for their app, grrrr! Next was the hack “SpeakBack” by Erik Beijer, Ryan Bril, Maikel Vreugde, Michael Jepson, Bas Peters, and Dion Segijn from CMTelecom. They used the resources of VoxImplant to provide video calling / conferencing. The hack was a presentation overlay enabling the audience to connect with the speaker and ask questions by mobile phone. The audience could be on-site or remote watching a live stream, this is a great way to include the complete audience. We’ll be trying this out at the next TADSummit. And it also captures all the questions, as often the audience asks a question and the recording does not capture the audio only the speakers response, starting with “Great question…”. Next we had an important hack / demonstration from Steven of DesignTotal.nl and Rianne Goijarts (WebRTC-Multimedia hacker / developer). The hack was called “Whatshack,” a reverse look-up of phone numbers to Whatspy Public to WebRTC. This hack creates a script to access the 900 million active accounts (likely >1B accounts in total) using telephone numbers. The above data could be sold onto spammers and on the black market of app developers. To wrap-up part 1 of the TADHack Paris Review we finish with a hack of a prototype speaker recognition platform using WebRTC audio capture by MD Ibrahim from GreenKey Technologies. Its a great example of using WebRTC for authentication using voice data. This generated much discussion in the audience and is clearly an emerging hot topic. TADHack Paris generated many impressive hacks, telecom app development is a powerful emerging topic. I don’t think so, it was just a hack.